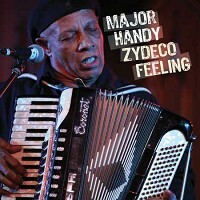 Zydeco Feeling is among the strongest front-to-back offerings in the APO Records catalog. And Track Three – "I'm On The Wonder" – might just be the best slow blues the label has yet recorded. Accordion-led and with half the lyrics in French, neither declaration would look likely to the unknowing, but Major Handy offers such bare emotion, building and smoldering, the performance on each song seemingly inspiring the next. This is just a damn fine record, and from an artist few outside of southwest Louisiana will have ever heard. This is the first Zydeco title on APO, and it was after careful consideration that Major Handy was selected as the artist we most wanted to record. It finally became apparent that in Handy we had the opportunity to work with an artist of uncommon power and energy, someone who lays into each of his songs, not "overplaying," mind you, just flat giving it. Buckwheat Zydeco, the most commercially successful of today's Zydeco artists, leads the backing band here. Buckwheat, known best on accordion, instead plays his first and still favorite instrument, the Hammond B3 organ. Ace guitarist Paul "Lil' Buck" Sinegal, unquestionably the best Zydeco guitarist of the last 30 years, is also onboard, blistering when appropriate without ever stepping on the groove. And top-call bassman Lee Allen Zeno anchors it all, capping what's truly an all-star cast of accompaniment.